This article is about Imamate as a principle of Shi'a school. For explanation about Imams of Shi'a, see Imams of Shi'a. Imamate (Arabic: الإمامة), from Shi'a point of view, is the leadership of the Islamic society, designated by God to succeed the Prophet (s) in all religious and worldly affairs. It is among the principles of Shi'a school and one of the points of difference between Shi'a and Sunnis. The importance of this principle among Shi'a led them to be titled as Imamiyya. According to Shi'a teachings, the Prophet (s) made a lot of efforts to introduce his caliph and the leader of Muslims after himself since the beginning of his mission. His efforts towards this aim began since his first public invitation by introducing 'Ali (a) as his caliph and successor and continued until the last days of his life on the way back from Farewell Hajj on Dhu l-Hijja 18 in event of Ghadir Khumm. Sunni Muslims also emphasize on the necessity of an Imam and to obey him, however, they believe that it is upon the Muslim umma to elect an Imam and that the Prophet (s) has not appointed any person as his successor. During history, Shi'a have found different opinions about the number and instances of Imams. According to Imamiyya Shi'a, the number of Imams (a) is twelve; the first of whom was Imam 'Ali (a) after Imam 'Ali (a), Imam al-Hasan (a) and then his brother Imam al-Husayn (a) became Imam and after these three, nine descendants of Imam al-Huasyn (a) became Imam one after another and the last Imam is Imam al-Mahdi (a).. The reason behind Imam's existence is to safeguard and transfer religion and correctly explain religious teachings; therefore, to perform his duties properly, it is necessary for an Imam to have the power to abandon sins, God-given knowledge and Wilaya (guardianship) from God. Literally, imamate means leadership and the word "imam" refers to one or thing followed by people. Accordingly, different examples for this meaning have been provided in Arabic dictionaries such as the Qur'an, the Prophet's (s) successor, imam of congregational prayer, a commander of an army, a guide of passengers, a caravan leader, a camel herder, and a scholar who is followed. In the Qur'an the word "imam" is used both for some human beings and for referring to other issues; non-human usages of this word are: preserved tablet (al-Lawh al-mahfuz), an open highway and the Book of Moses (a). The usage of this word for humans has been two kinds: imam of the truth and imam of the falsehood. The cases of the imam of the truth are: prophets (a), righteous servants of God and the oppressed. Leaders of disbelief such as Pharaoh and his agents are imams of the falsehood in the Qur'an. Also in some cases, the word "imam" is used including all the mentioned usages, "The day We shall summon every group of people with their imam" (Quran 17:71). Some definitions are general and include prophethood as well; for example, it has been defined as the "general leadership in religious and worldly issues". The second definitions are those which regard imamate as the succession of the Prophet (s) in religious affairs and consider following imam obligatory. Given the above mentioned points, it can be said that the definition of imamate as the "leadership of the Islamic society in religious and worldly affairs as the successor of the Prophet (s)" is accepted by all Islamic schools. Shi'a regards imamate one of the Islamic doctrines of faith, but Mu'tazilites, 'Asharites, and other Islamic schools consider it among secondary beliefs. Accordingly, Shi'a have a more prominent position for imamate compared with Sunnis. In Shi'a culture, imamate includes more duties and responsibilities, in addition to those of a caliph. Its importance can be clearly understood from verses of the Qur'an and hadiths about imamate because according to Shi'a, imamate is in fact a matter similar to prophethood. The special position of imamate among Muslims also becomes obvious when the matter is historically studied. After the Prophet (s) passed away, the most important and critical issue debated and discussed among Muslims was imamate. No other religious teaching has ever been argued over like imamate has. Leadership of the Islamic society after the Prophet (s) is called both caliphate and imamate and the one who take over this position is called both caliph and imam. From the point that people have to follow him, he is called imam and from the point that his leadership is in succession of the Prophet (s), he is called caliph. Therefore in Islam, imam is the caliph and successor of the Prophet (s). However, about the question whether he can be called as "Khalifat Allah" (vicegerent of Allah), there are two opinions among Sunni scholars; some regarded it permissible and some others considered it impermissible. Ahl al-Bayt (a) have also regarded imamate as succession of God and His Prophet (s). Moreover, in this verse, God refers to imamate as His pledge. Therefore, this position is not subject to election by people. This has also been mentioned in hadiths. The importance of imamate is evident in hadiths mentioned about the al-Ikmal Verse (perfection of religion). 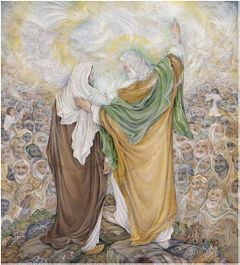 According to these hadiths, the mentioned verse has been revealed about the event of Ghadir Khumm when by the order of God, the Prophet (s) introduced 'Ali (a) as the leader of Islamic society after himself. Accordingly, Islam reached its desired perfection through imamate. The al-Tabligh Verse is also referring to the same issue; since, according to this verse and the hadiths about the cause of its revelation, imamate has such a great position that if the Prophet (s) did not announce it, it was as if he (a) had not accomplished his mission and his efforts would be lost. According to the Qur'an, on the Day of Judgment, everyone goes to his own leader, "The day We shall summon every group of people with their imam" (Qur'an 17:71). This is also mentioned in a hadith both Shi'a and Sunnis have narrated from Imam al-Rida (a), it says that on the Day of Judgment, every group is summoned by their divine book and the tradition of their prophet and leader. Imam 'Ali (a) said, "Imams (a) are God's guides and leaders for His servants and no one will enter the paradise unless he knows them and they know him and no one will enter the hell unless he rejects them and they reject him." In many hadiths narrated from Imams (a), it is mentioned that prayer, zakat, fasting, hajj, and wilaya are the pillars of Islam, among which wilaya has a better position because it is the key and guide to the rest. From the viewpoint of Twelver Shi'a theologians, imamate is incumbent and its necessity is theological; i.e. it is incumbent upon God, not necessary for people. The meaning of this necessity is that it is a matter required by justice, wisdom, grace, and other attributes of God's perfection; and since, abandoning it implies a deficiency in God and thus impossible, thus doing it is necessary and incumbent upon God. However, this obligation roots in God's attributes of perfection, not an outside obligation. As God has made mercy and guidance obligatory upon Himself, Nasir al-Din al-Tusi says, "Twelver Shi'a believe that appointment of Imam is an act of grace; because it draws people near to obedience and away from disobedience; and that grace is incumbent upon God." Most Islamic schools consider imamate necessary, even though there is a disagreement about whether it is a jurisprudential, theological, or rational obligation. 'Asharites regard it obligatory but because they do not believe in rational goodness and evil (al-husn wa l-qubh al-'Aqliyyayn) and any obligation for God, they regard imamate obligatory for people due to hadiths, not rationally obligatory. 'Adud al-Din al-Iji believes that 'Asharites consider appointment of Imam obligatory according to hadiths meaning that existence and appointment of Imam is necessary because God has said so, not because our intellect has concluded it. Mu'tazilites, Maturidites, Abadiyyas, and a group of Zaydis regarded imamate incumbent upon people. Some Mu'tazilites regarded the necessity of imam rational and some others considered it necessary due to hadiths. In this verse, God orders people to obey Uli l-Amr, thus, they need to exist in the first place so that people obey them. Al-Taftazani refers to this reason and says. "the necessity of obedience from Uli l-Amr requires its actualization." The Prophet (s) said, "One who dies not knowing Imam of his time, dies the death of ignorance." Some Muslim theologians has interpreted this hadith as the reason for the necessity of imamate, since according to this hadith, knowing Imam at any time is a religious duty and requires constant existence of Imam. Some theologians have regarded the tradition of Muslims as the reason for necessity of imamate since it can be understood from the tradition of Muslims that they have considered the necessity of imamate a certain and unshakable issue. The disagreement between Shi'a and Sunnis has been actually over the case of imamate, not its principle. Abu 'Ali and Abu Hashim al-Jubba'i and some others have referred to the consensus of the companions on necessity of imamate. The most important rational reason theologians bring for necessity of Imamate is the principle of grace. Shi'a theologians consider Imamate a clear example of the principle of grace and have said that God should be kind to His servants and appointing and introducing Imam is an act of grace, thus imamate is incumbent upon God. "We know that human beings have rational duties and we know that the duty-bound (Mukallaf) are not infallible. Therefore, the reason for necessity of imamate is that any intelligent person who is familiar with the common sense and the tradition of the wise would know that whenever there is a competent and wise leader in a society who stand against tyranny and evil and defends justice and human values, social situation will be readier for development of virtues and values and this nothing but God's grace, since grace is what causes the duty-bound turn to obedience and virtues and turn away from vices and evil. Therefore, imamate is an act of grace towards the duty-bound." Theologians such as Ibn Maytham al-Bahrani, Sadid al-Din al-Himsi, Nasir al-Din al-Tusi, and others have had different explanations for imamate and its necessity with regards to the mentioned principle [of grace]. Even though Mu'tazilite theologians have accepted the principle of grace, they do not accept its effect on this issue and that imamate is an act of grace and have mentioned some criticisms which al-Sharif al-Murtada have answered to in al-Shafi fi l-imama. Since Sunnis consider imam only a political leader of the society, they mention establishment of a government, performance of ordinary responsibilities of the government and management of the society as the philosophy for the existence of imam. For example, from Mu'tazilite viewpoint, performing religious rulings, guarding the existence of the Islamic society, preparing and mobilizing soldiers to fight with the enemy and such affairs are included in responsibilities of the Imam. However, Twelver Shi'a have stated two kind of goals for the existence of Imam. The first kind are the same practical goals and benefits Sunnis have mentioned. Accordingly, preserving the Muslims' social system, establishing social justice, Islamic rulings especially those with collective aspects and performing religious punishments have been mentioned among the goals of imamate. However, another area which covers the most important goals of imamate include: delivering, preserving and explaining religion. From the Twelver Shi'a viewpoint, God has revealed religion to the Prophet (s) in complete form and the Prophet (s) has delivered it to Imams (a) in complete form so that they gradually explain all the rulings to people. Accordingly, details of the rulings related to worship, contracts, unilateral deals, heritage, punishments, blood-money are not mentioned in the Qur'an and the conduct of the Prophet (s). What is mentioned is the general aspects of these rulings. The rulings we have received through hadiths of the Prophet (s) are limited and not all of them are authentic regarding their references. Therefore, to compensate for this deficiency, Sunnis have had to use means such as qiyas (deduction by analogy), istihsan (judicial preference) and other sources which do not bring about certitude. Qiyas, istihsan and other non-certain methods are regarded invalid by Shi'a, since we do not have any authentic rational or legitimate proof according to which such methods can be used in the process of judgment. For example, fasting the last day of the month of Ramadan is obligatory, the first day of Shawwal forbidden and the second day of Shawwal is recommended while these days are the same apparently. Therefore, just based on their similarity, one cannot extend the ruling for one to another. From Shi'a viewpoint, the Prophet (s) has delivered Islam fully and there has not been any deficiency in it to be compensated by qiyas or istihsan. However, due to people's lack of maturity and lack of many issues at that time, many rulings would not be applied to common people at that time. The Prophet (s) taught these rulings to Imams after himself so that they later explain them to people. Another criterion which necessitates the existence of imam and is mentioned among philosophies of the existence of imam is guarding religion. Accordingly, existence of imam helps religion to be saved from alterations, because the Qur'an has neither explained the details of rulings, nor does it speak by itself and needs interpretation. However since people's understanding of the Qur'an would be wrong, there is a need for those whose understanding of the Qur'an would be free from error or alteration. Their existence is a standard for recognizing others' misunderstandings and it would be what guards religion. Moreover, rulings and teachings which have been narrated as agreed by consensus or by many people are few and do not cover all the rulings of religion. Also, consensus alone, without referring to the ideas of the Infallible (a) is invalid. Therefore, the only way left is that religion would be guarded by an infallible imams (a), because then his opinion is all right due to his infallibility and through which other opinions interpreting the Qur'an and explaining religion can be evaluated. Among other factors which necessitate the existence of Imam is explanation of those religious rulings and teachings which have not been explained by the Prophet (s) due to lack of time and appropriate situation and they have been left to imam for explanation. One of the conditions and requirements of imamate is his immaculacy from sins and error in carrying out his duties and mission. The reason for it is that imam is the successor of the Prophet (s) and the reference in religious rulings and teachings, the Qur'an and the conduct of the Prophet (s). Therefore, he needs to be immaculate from sins and errors so that people can trust on him and his words. Otherwise, people's trust would be lost and God's goal from appointment of imams would be found meaningless. Infallible imams (s) had some other knowledge beside those they had heard directly or indirectly from the Prophet (s). That knowledge is among extraordinary knowledge which they have been given through inspiration and intuition such as those given to Khidr (a), Dhu l-Qarnayn, lady Mary (a) and mother of Moses (a). It was having such a knowledge that made some Imams (a) reach imamate in young ages. Thanks to this knowledge, they were aware about anything they needed for the guidance of people and carrying out their duties and did not need to learn them from others. Wilaya is a closeness to God which brings about a certain power of influence for the closed one. This Wilaya has two types: in creation and in religion. Wilaya in creation or Wilaya over creation is Imam's guardianship over creatures of the world and influencing on them. The other type is Wilaya in religion which includes Imam's guardianship in interpretation and explanation of the Qur'an, the conduct of the Prophet (s) and leadership of the society. It means that Imam's words and his interpretation of God's word is authoritative and necessary to be obeyed. This attribute is the result of benefiting from God-given knowledge and knowing God's intention in verses of Divine Books. Imams of Shi'a are twelve people from the progeny of the Prophet (s) who are intellectual, spiritual and political leaders of Shi'a. The first one of whom was Imam 'Ali (a) and the rest are Imam 'Ali (a) and Lady Fatima's (a) children and grandchildren. According to Shi'a beliefs, after the Prophet (s), leadership of the Islamic society would always be upon Imams (a) who have been appointed by God. These Imams (a) have God-given knowledge, infallibility and the rights of intercession and by making Tawassul to them, one can become close to God. In addition to authority in religious teachings, these twelve Imams (a) have political leadership of the society as well. There are many hadiths from the Prophet (s) which have described their attributes and mentioned their names and show that all of them are from Quraysh and among the Ahl al-Bayt (a) of the Prophet (s) and the Promised Mahdi (a) is the last one of them. As it was mentioned, imamate is among challenging doctrines which has been the center for many arguments since early Islam. One of the questions mentioned about it is that imamate as explained above and Shi'a believe in is incompatible with Khatamiyyat (the End of Prophethood); since, the person qualified for imamate as Shi'a believe in has no difference with the Prophet (s). "The difference between prophethood and explanation of the knowledge of the Holy Prophet (s) is obvious and does not need much explanation; as prophethood means that the Prophet (s) receives revelation, hears God's word, sees His messenger and either delivers an independent religion or preaches the religion before himself. But Imam is the keeper of the knowledge of the Prophet (s) in whatever people need without being addressed by revelation, without hearing God's word or seeing the angel carrying the message." Moreover, some others believe that imamate as defined above is only a result of Shi'a's exaggeration and has not been existed in early authentic Islamic texts and beliefs of the Shi'a in the first centuries. Hakim al-Niyshaburi, Muhammad b. 'Abd Allah al-. Al-Mustadrak 'ala al-Sahihayn. Humsi, Mahmud al-. Al-Munqidh min al-taqlid. Ibn Khaldun, 'Abd al-Rahman b. Muhammad. Muqaddama Tarikh. Jawadi Amuli, 'Abd Allah. Wilayat-i faqih. Qifari, Nasir b. 'Abd Allah. Usul madhhab al-Shi'a. Subhani, Ja'far. Al-Milal wa l-nihal. Tabrisi, Fadl b. Hasan al-. Majma' al-bayan fi tafsri al-qur'an. Amini, Ibrahim, Imamate and The Imams, translated by: Hamida Ilahi Nia, Qom, Ansariyan Publications. This page was last edited on 21 June 2018, at 01:26.